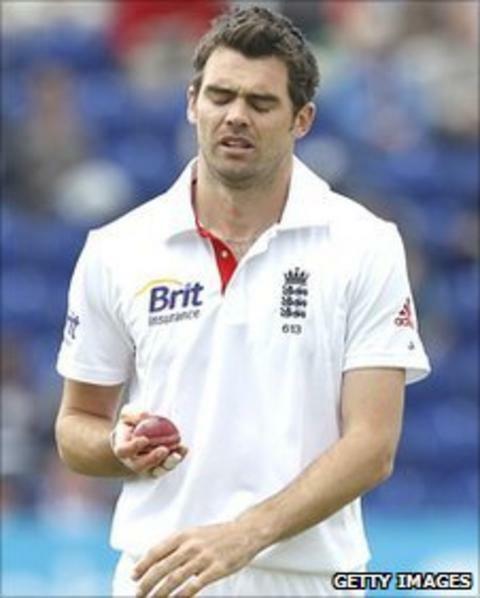 England fast bowler James Anderson has been diagnosed with a side strain and will not bowl for the remainder of the first Test against Sri Lanka. The Lancastrian sustained the problem during day two in Cardiff and twice had to leave the field for treatment. England's medical team have said he has a grade one strain, which usually requires two to three weeks of rest. Anderson will be able to bat but he is now a major doubt for the second Test, which starts on 3 June at Lord's. The 28-year-old was the pick of the England bowlers on day two but he was only able to contribute one over in the evening session, and his absence exposed the vulnerabilities of the hosts' four-man attack, as Sri Lanka amassed a strong first-innings score. Wicketkeeper-batsman Prasanna Jayawardene was particularly impressive, hitting 112. Anderson re-emerged late in the day as nightwatchman, as England reached stumps on 47 for the loss of captain Andrew Strauss, but worry remains about the Lancashire man's readiness to bowl. "Obviously it's a huge concern for us," said Broad, who experienced side problems of his own that caused him to miss much of the recent Ashes tour down under, and contributed to his departure from the World Cup earlier this year. "I know what side injuries are all about after this winter, and when you get a little bit of pain it's not great. "It is one of the frustrating injuries as a bowler. Hopefully it will just be a little tightness." Broad does not believe Anderson's batting duties will aggravate any injury and he hopes his colleague can frustrate the Sri Lankans on day three of the Test. "Jimmy is not feeling pain when he's batting and hopefully he'll have one of those frustrating hours on Saturday when he wears a few but gets it away. "With my side-injury I could do pretty much everything but bowl. An extensive pull-shot might strain it or something but we don't really see Jimmy playing a huge amount of them; he's more of a clip-to-fine-leg man." Despite proving a difficult day for England, 24-year-old Broad reached a significant personal milestone of 100 Test wickets when he removed Thisara Perera, becoming the second youngest England player to do so after Ian Botham. He preferred not to dwell on the achievement for long, instead focusing on England's prospects of winning the match from a difficult position. "I felt in really good rhythm to be honest," he said. "I'd prefer it to have come at 90 for one, not 300-and-odd for eight, to be honest, but it was hard work out there. "I actually thought we bowled pretty well and stayed together. It would have been easy to get quite ragged this afternoon but we did pretty well, created chances and had four or five pretty decent lbw shouts and a few nicks that didn't go to hand." Broad used the performance of Australia in Cardiff during the 2009 Ashes series as a template for how England could still fight their way back into this match. "I think we're in a pretty good position. If we can bat big and bat once we have a chance of winning this Test match," he said. "We got 435 against Australia in 2009 and we were under the pump for the last 120 overs. That's got to be our mindset really: do what Australia did to us, try and bat big and bat once then hopefully Swanny will be in the game on the last day. "Saturday morning is going to be a key moment in the game. It's important we get through that session and build big partnerships. Having watched the guys in Australia we know we can do that." Sri Lanka centurion Jayawardene says he loved the pressure of batting at number six, after his third Test century enabled his side to take control of the match in Cardiff. Some had questioned the wisdom of going with six batsmen and five bowlers at Cardiff with Jayawardene promoted to six, but his success, along with useful contributions from Tillakaratne Dilshan (50), Thilan Samaraweera (58) and opener Tharanga Paranavitana (66) proved the doubters wrong. "I love handling pressure. I don't know why everyone thinks that I am under pressure because I have always proved myself when I have played for Sri Lanka," said Jayawardene. "It is a new challenge for me, normally I bat at seven but all the management have supported me and I think I have rewarded it. "Everyone wants to get a hundred in England. I think I had some luck, I knew I had a good chance but I didn't think about it. I just batted normally and I am very happy about that. "I scored 150 in India [in 2009] but this is a special thing, as I have been on many tours of England before but never got to play a Test, so I am happy to make a hundred in my first innings." Having taken control of the game, Jayawardene now hopes his side can press home their advantage. "We have a good total and we got a big wicket," he said. "We need to be fresh tomorrow, do our basics with the ball and if we do that we can make a big difference."